CBS analyst Tony Romo breathes life into an otherwise lackluster Super Bowl 53 with his wit, expertise and insight. Tony Romo is the true Super Bowl 53 MVP as he salvaged perhaps the most disappointing Super Bowl ever. 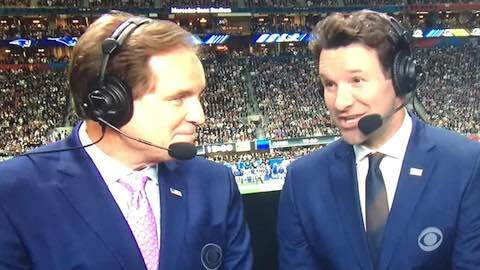 At the start of the broadcast, Jim Nantz said, "Welcome to the Super Bowl, Tony Romo." Romo responded, "I've been waiting to hear 'Welcome to the Super Bowl' my whole life." Romo's self-depricating humor in this case acknowledging finally making it to the Super Bowl. Romo posted a 2-and-4 playoff record as the Cowboys never advanced beyond the divisional round during Romo's 14-year tenure as quarterback. Romo after Jared Goff and the Rams offense sputtered yet again: "This is hard to watch." "You wanted an offensive game? Too bad." After Zuerlein's 53-yard field goal tied the game at 3 in the third quarter: "3-3 and it feels like we've got a scoring spree going on." "I can't believe it, we got points! ... 3-3 and it feels like we got a scoring spree going on!" When Tom Brady audibled "Reagan" Romo responded: "Obviously, Reagan means run to the right." CBS coverage of Super Bowl LIII between the New England Patriots and the Los Angeles Rams posted a Total Audience Delivery of 100.7 million viewers, across all platforms including CBS Television Network, CBS Interactive, NFL digital properties, Verizon Media mobile properties and ESPN Deportes television and digital properties. Super Bowl LIII was watched on CBS in all-or-part by 149.0 million viewers on an all-or-part basis according to Nielsen's Fast Total Audience Estimates. NFL Football: "Super Bowl 53: Tony Romo's MVP Performance"